Luc Richard Mbah a Moute has averaged 17.7 minutes per game since coming to Minnesota in a trade with Sacramento in late November. 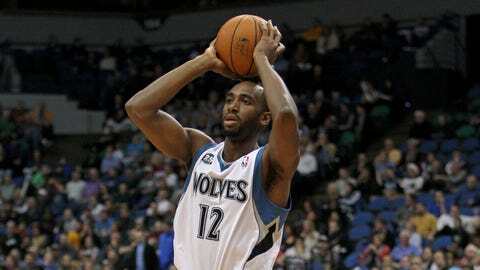 MINNEAPOLIS — For Luc Richard Mbah a Moute, the whirlwind continues to gust. The newest Timberwolves player didn’t expect anything but a frenzy when he was traded Nov. 26 from Sacramento in a straight-up exchange for Derrick Williams. But more than a month later, the versatile, defensive-minded Mbah a Moute’s life is still fraught with transition. New city. New system. New coworkers. And a new rotation that changes from night to night. "Still adjusting," Mbah a Moute said. "It’s kind of tough in a situation like this, in the middle of the season. This is my first time doing it. A team like this, with a system, kind of everything’s set. I’m just trying to fit in." The latest hurdle came in Wednesday’s win against New Orleans, when Mbah a Moute injured his groin and wasn’t able to return. He didn’t do much in practice Thursday, didn’t practice at all Friday, and may or may not be available Saturday when Minnesota hosts Oklahoma City. That’d be a blow to the Timberwolves’ chances to go over .500 for the first time in seven tries since late November, given that Mbah a Moute and starting wing Corey Brewer would’ve been asked to take turns guarding Kevin Durant. But that expectation, unfulfilled or not Saturday night at the Target Center, illustrates the value coach Rick Adelman and the rest of the front office saw when they realized Williams wasn’t working out here. "He’s a very good defender," Adelman said of Mbah a Moute. "What I like about him is he’s very physical, but he’s smart. He knows who he’s guarding, too." That’s been the book on Mbah a Moute for most of his six-year career — the first five seasons of which were spent in Milwaukee before the Bucks shipped him to Sacramento this past offseason. At 6-foot-8 and 230 pounds, the Cameroon native is thick enough to guard fours and quick enough to guard twos, as he’s exhibited in several different spot defensive roles throughout his 15 games with the Timberwolves. Playing 17.7 minutes per game, his defensive numbers aren’t anything special — 1.6 steals and 0.4 blocks per game — but Mbah a Moute is the kind of defender whose contributions are more esoteric than anything, according to Adelman. He understands help defense, is rarely out of position and doesn’t get burned frequently. It’s all allowed Mbah a Moute to find his place in a league defined by scoring and flash. "He just stays solid," Adelman said. "I think he’s one of those guys who understands you’ve got to make the (other) guy work. You’ve got to make him make shots over you; don’t gamble and give him something easy." Generally, Adelman has Mbah a Moute spell Brewer and match up with an opponents’ top scorer on the floor. Wednesday, that meant frequent clashes with Pelicans sixth man Tyreke Evans. Evans scored 16 points, but it came on 6-of-14 shooting. But Wednesday also provided the most recent exposure into Mbah a Moute’s deficiencies at the floor’s opposite end; he scored three points on one field-goal attempt in 15 minutes and averages four points per game on 46 percent shooting this season. In Adelman’s cut-heavy, corner-based offensive sets, there aren’t a whole lot of opportunities for Mbah a Moute to score points. While he’s fairly efficient around the rim, several open chances have gone wanting. And he knows they’re few and far between. "No doubt, my offense is something that needs to continue to get better at this year or anywhere for the rest of my career," Mbah a Moute said. Adelman’s systems, Mbah a Moute said, are strict and involved enough that one doesn’t simply grow accustomed to them overnight. A nightly mish-mash of bench rotations further muddles the picture. One night, Mbah a Moute may line up at power forward with Kevin Love or Nikola Pekovic at center alongside him. The next, he may be asked to play the wing with both starting bigs still on the floor. His game reps have been sporadic, too — 26 minutes here, 14 there. "That’s probably the biggest thing, because (other teams are) gonna do things to take things away from Kevin and Pek," Adelman said of Mbah a Moute’s offensive game. "Usually when that happens, someone’s gonna be open. A guy has to be able to hurt them one way or the other, and I think (Mbah a Moute’s) still learning when that’s gonna happen to him." But in a month’s time, Mbah a Moute appears to have earned more of Adelman’s favor than the man whose roster spot he filled did in two-plus years here. Williams’ inability to play both forward positions made him an impossible fit behind Love, and the Kings liked his athleticism enough to grant him a fresh start somewhere else. Williams’ shooting percentage has improved from 35.2 percent to 47.5 since the trade. In 18 games with Sacramento, he’s averaging 9.1 points and 3.7 rebounds per game. Mbah a Moute, meanwhile, continues to absorb and focus on working through whatever adjustments he’s asked to make. It’s what he’s being paid to do, he said. "Sometimes you play a lot, sometimes don’t play, play a different position," said Mbah a Moute, who has scored in double figures just once since first donning a Timberwolves jersey. "That’s what happens when you come to a new team during the middle of the season. "I think I’ve still got enough time, a lot of games to get better and adjust."